Cowboy Cookies - Home. Made. Interest. 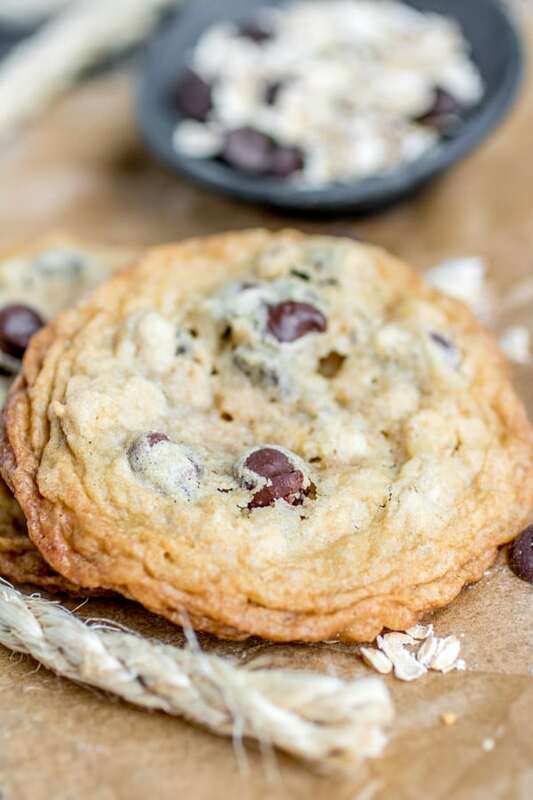 Cowboy Cookies are classic chocolate chips cookies and perfectly chewy oatmeal cookies baked into one amazing homemade cookie recipe! Have you ever heard of Cowboy Cookies? I’ll admit before I got married I had never heard of them but they happen to be one of my husband’s favorite cookies and my mother-in-law kindly gave me the family recipe for them. 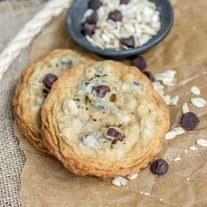 These tasty little cookies are a combination of two classic cookies, chocolate chip and oatmeal. They are chewy, chocolaty, and totally delicious! Cream butter, white sugar and brown sugar together until it is smooth. Add the eggs, baking soda, baking powder, salt, lemon juice, and vanilla. Continue to mix until everything is combined. Add the flour 1/2 cup at a time, letting it blend together between each addition of flour. Stir in the chocolate chips and rolled oats. Cover the mixing bowl with plastic wrap and place it in the refrigerator to chill the dough for about 30 minutes. Once it is chilled place the dough onto cookie sheet, using about 2 tablespoons of dough per cookie. Bake at 375 degrees F. for 10-15 minutes, until edges are light brown. Cool on rack for 2 minutes, then transfer to cooling rack. 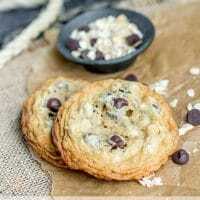 This Cowboy Cookies recipe also makes a great cookie-in-a-jar recipe! I’ve given them as gifts several times and they are simple to assemble. Layer all of the dry ingredients in a mason jar, screw on the lid, and attach a recipe card. Then whoever you give the jar to just adds the wet ingredients and bakes the cookies. It’s a great homemade gift for the holidays! 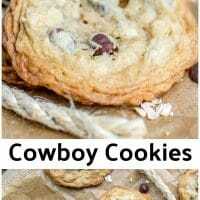 There are a lot of variations of Cowboy Cookies out there. I have seen them with pecans and sweetened coconut flakes, and I’ve even seen a few versions that use rice cereal or corn flakes. 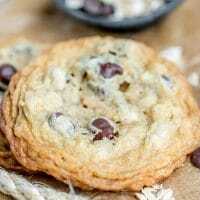 This Cowboy Cookie recipe is the one that my mother-in-law has passed on to me and my family loves it. I hope yours does too! Cream butter, sugar and brown sugar together. Add eggs, baking soda,baking powder, salt, lemon juice, and vanilla, continuing to mix until fully combined. 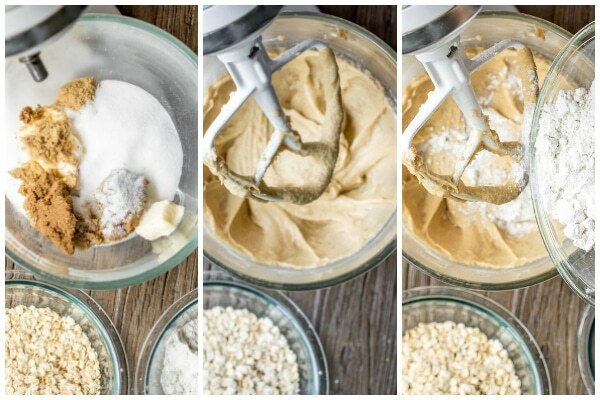 Gradually add flour ½ cup at a time, letting it mix completely in between each ½ cup. Cover mixing bowl and chill dough for about 30 mins. 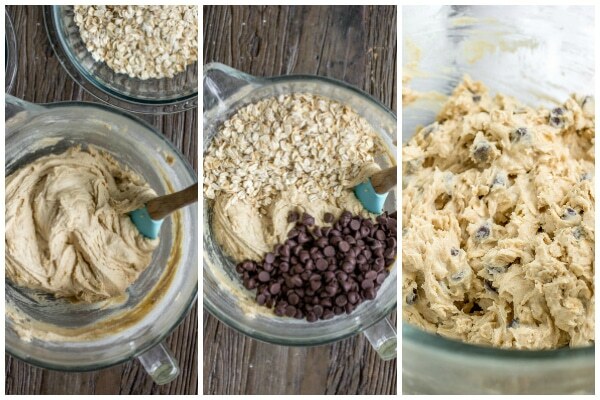 Spoon onto cookie sheet, about two tablespoons of dough per cookie. Space them 2 inches apart. Bake 10-15 minutes, until edges are light brown.